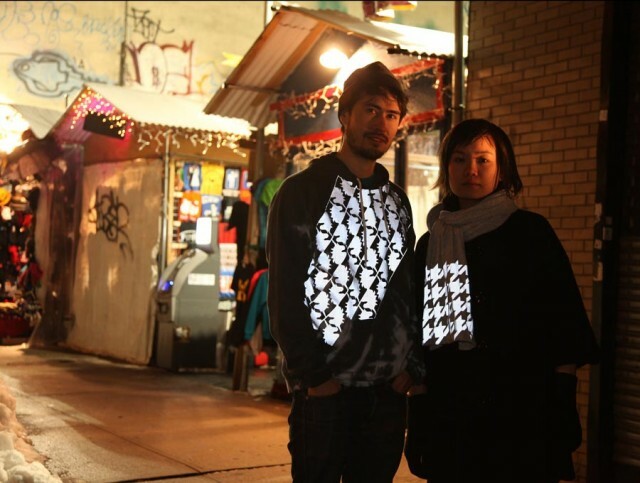 We Flashy is a collaborative project by NYU grad students Alex Vessels and Mindy Tchieu to make reflective but stylish clothing for bicyclists, pedestrians, and otherwise flashy people. Though initially a student project, Vessels and Tchieu intend to make We Flashy a viable business and they’re using Kickstarter to raise startup funds. The great thing about We Flashy items is that it reflects light on busy streets, but is barely noticed in normal indoor environments. It’s versatile enough to wear to school, work, or out for a drink. We Flashy uses industrial-grade reflective material–the same kind that crossing guards, police, and firefighters use. If lit by a light source such as headlights, the reflective material returns the light back to its original source, reaching the motorist’s eye.